What if there was a road map for today’s adult learners? 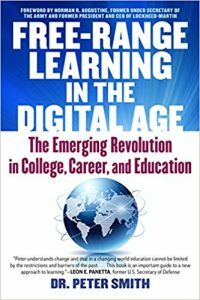 In his new book, Free-Range Learning in the Digital Age, Dr. Peter Smith explores what’s working in higher education today and provides adult learners examples of innovative pathways to higher education success in the digital era. On campus and online, college students have increasingly become a population of adults learners, as Dr. Smith puts it, with “hidden credentials” who are motivated to use their background and experience, coupled with the power of technology, to earn required certifications and degrees flexibly and affordably. According to Dr. Smith, adult learners with multiple demands on their time and money, benefit when there are easily accessible secondary education options that reduce pressure on limited resources. If you are looking to reach your career and degree goals in today’s digital learning environment, you’ll appreciate this in-depth look at models of education available to busy adults that can enable you to earn in-demand credentials on your terms and at a lower cost. We recommend Peter’s book to any student, adult learner, administrator, employer, or anyone interested in flexible higher ed options (and we’d say that even if our self-paced online college courses and our students hadn’t been featured for a in-depth chapter on online learning which highlights StraighterLine’s online college courses). In the excerpt below, Peter highlights what it means to be a free-range learner in the digital age and how so many resources are now available to adult learners. FREE-RANGE LEARNING IN THE DIGITAL AGE describes the silent learning revolution occurring in America. Many are not aware of this explosion of a vast scope and range of educational resources now available to adult learners. If you are one of the millions of Americans who has a high school diploma and no college degree, this book is for you. If you are trapped in a job that you don’t like and you know is beneath your capabilities, this book is for you. If you have a degree, but are stuck when it comes to improving your personal situation or getting the job that you want, this book is for you. If you just want to “learn your own way,” not the way a parent, a college, or an employer tells you to learn, this book is also for you. Or if you are an educator, policymaker, employer, or a person who advises others on learning opportunities, this book is for you, as well. The plain fact is that millions of Americans have historically faced huge barriers to getting the education and the jobs that they want. Since the end of World War II and the passage of the G.I. Bill, college has become increasingly more important to getting the right job for you. In fact, if you missed college the first time around (right after high school) you are, in all likelihood, relegated to a path in life with more limited opportunities for success. The ever-worsening consequences of these barriers include unemployment, underemployment, and frustration with a world that, all too often, is structured to reward only educational attainment. In fact, the cruel truth is that today, as I write, it is estimated that more than sixty million Americans have a high school degree and some college credits, but no college degree. And many millions more have graduated from high school but have no college experience at all.